Not only is this the easiest bread recipe I've ever tried, but it is also THE MOST DELICIOUS. And the best part about this technique is that you can have fresh bread every single day! Also, don't be overwhelmed by the amount of text in this recipe. 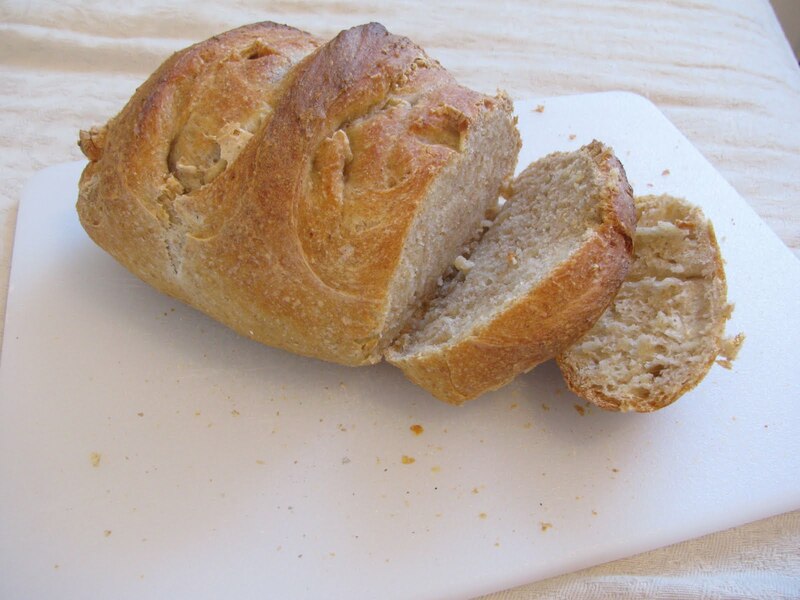 I've tried to include all of the tips and tricks I've learned in several years of making this recipe so that it's very easy to get a perfect batch of bread on your first try. A note on yeast and flour in this recipe: The original Artisan Bread in 5 Minutes recipe calls for 1.5 T yeast per batch. However, after making this recipe for several years, I've started decreasing the yeast in most batches I make and increasing the rising time. Most similar high-moisture bread recipes I've seen use only half a tablespoon of yeast and allow the bread to rise overnight. In my opinion, less yeast and a longer rise time makes for a yummier, more sophisticated crumb, so I typically do .5-1 tablespoon yeast and allow it to rise longer (usually 4-6 hours for 1 tablespoon and overnight for half a tablespoon, though if my kitchen is really warm 6 or so hours is usually enough for the smaller amount too). If I'm in a hurry, I still use the higher amount of yeast and a 2-hour rising time. The original recipe calls for all unbleached white flour. However, since we're big whole-wheat bread fans over here, over the years I've steadily increased the amount of wheat flour in my recipe. The amount of wheat flour that I can get away with without it resulting in a dense and heavy loaf varies greatly depending on the kind of flour used; if I use freshly-ground white wheat flour I can substitute all of the white flour for wheat, but if I use store-bought red wheat flour I can only get away with half to two-thirds. I try to make sure that my wheat flour batches have plenty of time to double in their initial rise, and I typically rest the refrigerated dough longer than white flour (40-60 minutes verses 20-40). Personally, Mahon and I have both come to prefer the taste and texture of this recipe with wheat flour, and it's still light and delicious with a perfectly crisp crust. In a large (5 quart) container, mix together all ingredients with a wooden spoon. That's all you have to do: mix gently until all the ingredients are combined and evenly moist. It will be very "gooey" and moist and not at all like a typical bread dough. Then stick your spoon in the sink, cover your bowl with something breathable (I typically do plastic wrap or tin foil, and I punch holes in the top of the covering—I tried a towel at first but my dough rose so high it stuck to the towel and that was a pain to clean off!) and let sit in a draft-free place for 2+ hours (see rising note above), until it's doubled in bulk. After that time, you can work with the dough (although it's easier to shape if it's been refrigerated first). Pull or cut a section of dough that's 1-1.5 pounds (about the size of a large grapefruit to the size of a canteloupe). Gently fold the edges of the dough under until you have a ball. (If your dough is really wet, you won't be able to do this; you can either add more flour or just plop some dough onto your pan. It's still delicious, but not quite as pretty.) Allow your dough to rise for at least 30 minutes (it's impossible to over-raise this dough, so feel free to leave it out a few hours, though it will lose a lot of its shape). 20 minutes before you are ready to put it in the oven, turn your oven on to 450 degrees. Place a dish with a lid (it can be an enamel-coated cast iron pot like Le Creuset, an oven-safe nonstick pot, or a glass or ceramic dish with a lid—I have been using an oblong vintage Pyrex baking dish and it's worked great) on the top rack of the oven and allow to heat with the oven for 20 minutes (it's important to heat it this long, or your dough will stick). If you don't have a lidded dish to use, that's okay! Cook it free-form on a regular baking sheet, and during the oven preheat time put a metal cake pan (empty) on the bottom rack of the oven. When you put the bread in, pour a cup of hot water into the cake pan and then close the oven door right away. Bake 35-40 minutes. One other thing—you may be tempted to brush the top of the boule with egg white/oil/something else, like you do in many bread recipes to create a better crust. I did that for awhile, but once I stopped doing it I realized how utterly stupid that was. Trust this bread: it will make you the tastiest, chewiest, yummiest crust you've ever tasted, no help needed. AN IMPORTANT TIP: I learned from Artisan Bread in 5 Minutes A Day that the proper way to store a crusty bread is NOT in a plastic bag. The best way to store crusty bread, it turns out, is to simply place it on the cutting board with the cut side down. I was a little skeptical of this idea at first, but it works GREAT. This bread is amazing the first day, pretty darn good the second day, edible the third day, and ready to be made into bread crumbs the fourth day—if it's still around at that point! A quick note on larger loaves— I have only used the method above with loaves that are fairly small (about 1-2 pounds). For a much larger loaf, you will want to reduce the heat a bit (probably to 400 or 425) and up the cooking time, so that the center of the loaf has a chance to cook before the crust browns too much. This is soft-crusted wheat sandwich bread like your mom/grandma/Relief Society president used to make. Although I've lately gone to using the Artisan Bread in 5 Minutes A Day method, I still have a soft spot in my heart for this recipe. Preheat oven to 350. In mixer with dough hook attachment, combine water and yeast. Add 3 cups wheat flour, salt, oil, and honey, and mix on low speed until combined. If desired, add a small handful of sunflower seeds to dough at this point. Slowly add in the rest of flour until your dough is no longer sticky and forms a ball on the dough hook, pulling away from the sides of the bowl. (A note on breadmaking: the flour measurement is NOT an exact science. Depending on the temperature, humidity, and other factors, you may need more or less flour. Once your dough ball is pulling away from the sides of the bowl and you can touch the dough without getting it all over your finger, then you have added enough flour.) Turn to a higher speed and let the mixer knead the dough for about 6-8 minutes. Remove dough from hook and form into a ball; spray with cooking oil (making sure to coat all sides) and let rest in bowl, covered, for about an hour or until doubled in size. Divide dough into 3 portions. Roll each portion flat with a rolling pin to remove air bubbles, then shape into a loaf (you do this by rolling your flat rectangle up into an oval and patting the ends together). Place loaf in sprayed loaf pan, cover, and allow to rise for another hour or until doubled in size. 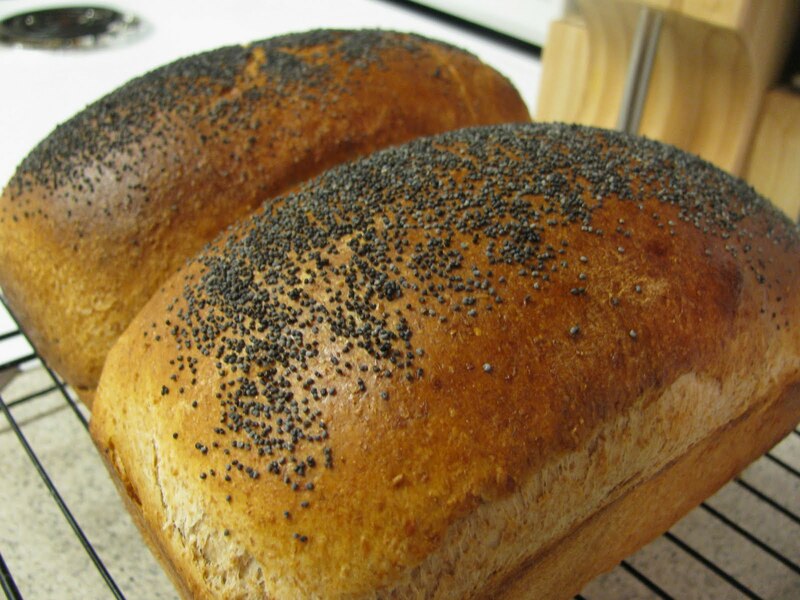 If desired, brush loaf with beaten egg white and sprinkle toppings over loaf—I use a mixture of ground rolled oats, ground flax seed, and poppy seeds. Bake in a preheated oven at 350 for 30 minutes, or until loaf is rich brown.